Our proven digital marketing co-op program is an exclusive opportunity for ADA members. Join the ranks of over 100 ADA dealer locations, and leading manufacturers like BraunAbility and Bruno to increase awareness and drive more leads to your showroom. With the recent launch of an improved website, The Mobility Resource is now primed more than ever before to convert users into buyers. We can import inventory via a live feed from your existing database. This automated tool allows us to feature inventory on our site with rich display ads, video, pictures and all essential vehicle info. Every participating brick-and-mortar dealer now has a custom local number so prospects can get in touch with you fast. No more lengthy forms or call centers. The Mobility Resource is in more places, more often online. That means increased traffic to our site and more leads for you. In the past year, leads have increased 67 percent for participating dealers. And we expect this number to increase even more in 2014. • We stay ahead of best practices. With the digital marketing world evolving almost daily, it’s important that we stay ahead of best practices. That’s why we regularly challenge our own thinking and analyze data daily to make sure we’re executing digital campaigns that deliver you the best ROI. • Thought leadership and influencer marketing. We regularly partner with several niche media outlets online. That’s why we regularly publish guest posts on several high-traffic blogs that appeal to our target demographic. You can find our content on Disability.gov, ADAP and Abilities Buzz, to name a few. 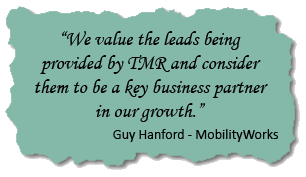 Drive more leads to your showroom with help from The Mobility Resource. It’s no secret that direct sellers continue to dominate search engine rankings. That’s why it’s more important than ever before to have your content and inventory in more places online.